Last week, a member of House of Rep. alleged that the immediate past Governor of Akwa Ibom State has bribed Senate President Saraki with a whopping N1.5 billion in order to emerge as one of the leaders of the National House of Representative. The allegations proved true this week when Saraki and his deputy Ike Ekweremadu shut down a member of his party, Senator Kabir Marafa who attempted to point out the illegality of Akpabio’s choice. Marafa called the attention of Saraki to the fact that as a first time senator, Akpabio was not qualified to occupy the position of the Senate minority leader, going by the Standing Orders of the Senate. Marafa cited Order 13 (2) of the 2015 Senate Standing Rules and argued that a ranking senator was supposed to have occupied the position given to Akpabio. But in apparent disregard for the Standing Rules Saraki told Marafa to “stop crying more than the bereaved”. He ruled out Marafa’s objection saying the PDP senators were not complaining and as such, urged Marafa not to. He was however overruled by the Senate President who said the constitution of Nigeria allows any senator to hold any position. Similarly, Ekweramadu of the Peoples Democratic Party (PDP) also opposed Marafa. He argued that it is the business of PDP to determine who is appointed as the minority leader. The Deputy Senate President also said “the rule only stipulates that ranking senators should be considered first before other non-ranking senators and that if a ranking senator cannot take the position for any reason, then the next level of ranking senators can be considered,” he said. Two members of PDP, had filed an ex parte application challenging the party’s choice of Akpabio as senate minority leader. 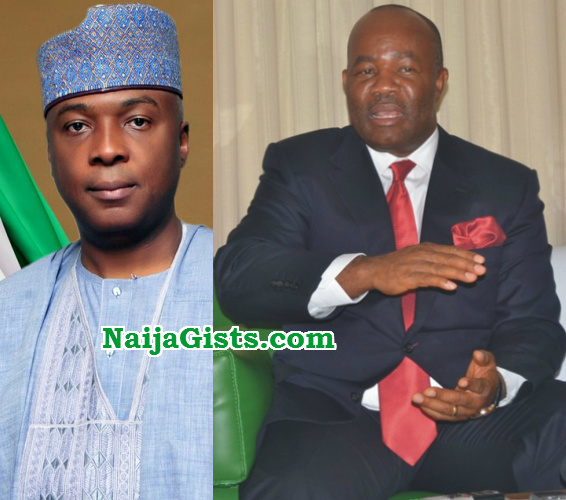 According to them, the ‎possible emergence of Akpabio as senate minority leader would breach the senate standing orders which bar first-term senators from holding such a position. The court however threw out their application. It is high time the excesses of Saraki-led senate is curbed by President Buhari. If care is not taken, Saraki will use his personal interest to jeopardise the general interest of the nation.